Arriving into bad weather wasn’t on the original plan, but it had taken us long enough to get to Løkken so a determination to shoot took over – I was there to shoot the hidden lighthouse, and that’s precisely what I was going to do, rain and sand storm or not. Set almost as far north as you can go in Denmark, Løkken has become somewhat of a local tourist-trap for its beaches more than anything, just an hour or so’s drive from Aalborg airport – the closest you can get by air. What had started out as a fantastic day of weather, however, soon closed in on us when we finally made it to the lighthouse following a 1.5km trek from the car. And the weather wasn’t the only disappointment. 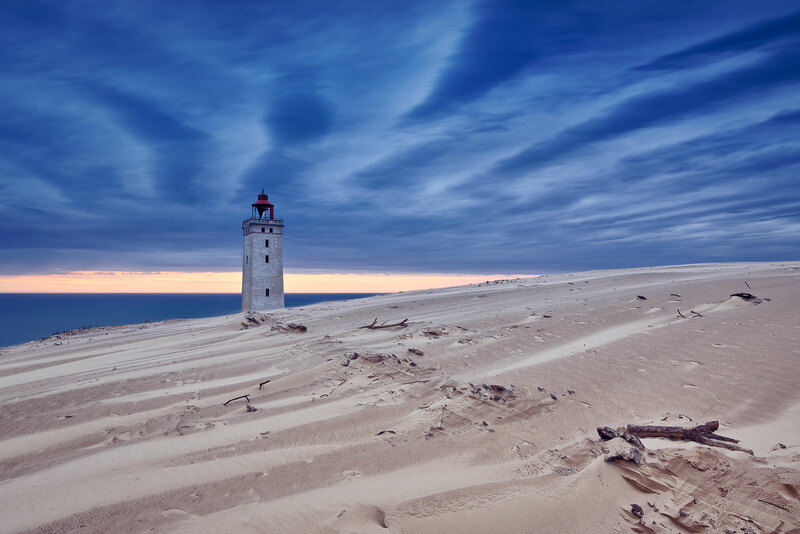 It seems that the erosion (which has been well-documented for years since it ceased operating in 1968) has taken a further toll on Rubjerg Knude Lighthouse in the past few years. The previous road had been completely over-run with sand (hence the trek), and the buildings at the base of the lighthouse itself had now completely collapsed – the bricks that once formed their walls scattered for hundreds of meters all around. Standing on the coastal side of the sand-hill, it was easy to see how such an extraordinary change had come about to this landscape. The sea, the wind, the storms above, are all taking their continual toll on this extremely exposed headland. With nothing but sand as a foundation, it really doesn’t have much of a chance of survival. Knowing that this lighthouse won’t be there for much longer (the predictions are that it will fall into the sea by 2023) – regardless of the eyes filled with sand, and bitter wind battering our faces – it was time to shoot. And there we have it – at 101 megapixels, not only has that dramatic sky been captured in all its glory, but each and every grain of sand is clearly visible in the large format print. It wasn’t the sunset I’d imagined, but it was better than I thought I’d get as we stepped foot out of the car. Exploring Løkken the next day, and it was easy to see why the Danish (and Germans) love spending time here – the coast is stunning, the air is clean and crisp and the water clear and blue. If it weren’t for that bitterly cold wind, I guess it would be almost perfect…! A short walk north of these classic beach huts and activity-filled coastline with kitesurfers, windsurfers, gliders, however – and the extent of the sea’s ferocious impact is more obvious once again. Dotted all along the beach are old World-War II bunkers, originally found on the hilltops above – in their exact positions where they originally sat, some 60 years ago. Getting closer to them, the impact of their falls is clearly evident, as is the existence of local graffiti “artists” (which now seems to be becoming an increasing issue across Europe). I can only imagine the sound and sight of one of these things crashing down onto the beach below as their last foundations of sand finally gave way. I’d made the mistake of thinking the previous night’s wind was an issue – it was a calm breeze in comparison. Having to cover my camera in-between every shot, chewing on sand for the entire time we were stood there, and the next day’s 2 hour kit clean-up were all good reminders that this was a really exposed location. But the sun was finally playing nicely, as were the clouds. 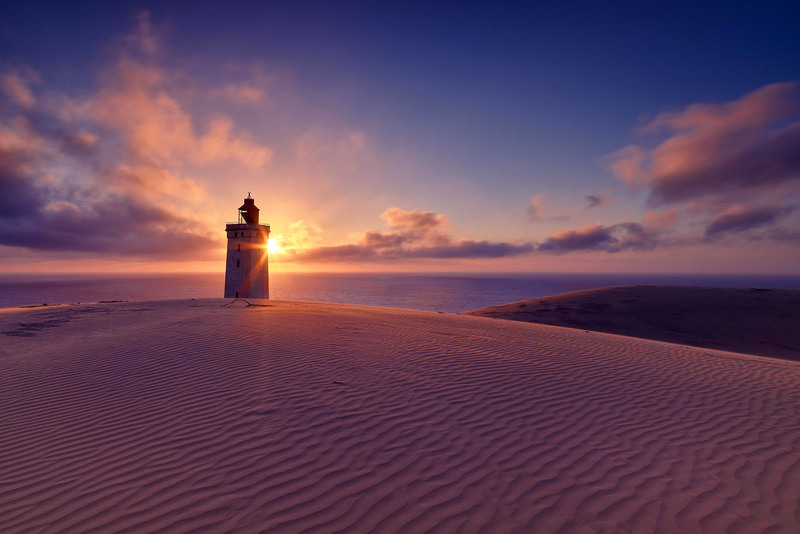 Just before the gap in the sky was swallowed by the surrounding formations, I managed that one key click – of a coastal lighthouse that has its days well and truly numbered, but in the meantime finds its home amid huge, constantly changing, dramatic dunes of sand. Was it what I expected to find? No. The ruins have been well and truly, well, “ruined”. In part by weather, but sadly also in part by human interaction. The site itself is surrounded by pieces of the collapsed structures, but also tonnes of litter and a staggering amount of graffiti. It’s such a shame that this once proud lighthouse, responsible to keeping ships safe from a treacherous coastline, is finding its demise to be accelerated by both environmental and human factors. And what about the other learnings from this trip? Well, first, Denmark really is a country that loves its bicycles. We found them everywhere, including at the end of the path we needed to trek along from the car – in the middle of nowhere, and fee to use! Secondly, don’t try to out-run giant sand-dunes if they start disappearing beneath your feet. You won’t catch up, and simply end up injuring yourself and your jeans! And finally, just because we tend to keep cows in fields with fences surrounding them in the UK, it’s not a safe assumption to expect the same in other remote locations. Oh, and cows are very interested in what humans are up to if they stay still with a camera for too long.